I love the miniseries "Band of Brothers". From the acting, production and historical detail to the fantastic battle recreations, it's an amazing blend of personal stories within the overall drama of WWII. But aside from a few minor roles, very few women are featured. I grew up craving female role models, so my fascination with "Band of Brothers," Saving Private Ryan and other WWII films puzzled me. The men are delicious, certainly, but I've finally identified the source of my interest: these dramas are windows into the male world. Because men behave hierarchically--a tendency that is compounded in military service where rank is codified--the forms of address used between soldiers can be very revealing. I'm going to reference three characters from "Band of Brothers," all based on real individuals, to demonstrate what I mean: Maj. Richard Winters (portrayed by Damian Lewis), Cpl. Eugene Roe, a medic (portrayed by Shane Taylor), and SSgt. 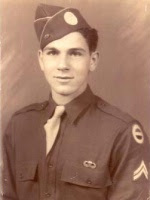 William Guarnere (portrayed by Frank John Hughes). Maj. Winters was an officer, and thus the possibilities for how he could address his men were much wider than those available to a private. He used surnames most commonly, combining formality with an admission of familiarity. Rank alone was used for newcomers or strangers. He reserved "sir" for addressing superior officers, and referred to them in conversation by rank and surname together. When addressing a subordinate officer in the presence of enlisted men, he used both rank and surname. The only person he consistently referred to by a given name or nickname was Capt. Lewis Nixon. Winters' use of "Nix" and "Lou" were ubiquitous--a testament to their similar status, education, and friendship. But we can assume that when referring to his friend in the presence of others, he would've called him Capt. Nixon. The use of given names and nicknames, both of which evoke closeness or familiarity, is complicated territory in the male hierarchy. As the war progressed and more of the original Toccoa men with whom he'd trained were lost, Winters began to refer to those remaining few by their given names--but only when he addressed them directly, and generally to draw authority from their sense of shared experience. For example, when Sgt. Frank Perconte is unable to explain his squad's discovery of the Landsberg concentration camp, Winters slows him down with the simple use of his first name. That subtle gesture implied a trust born of their shared experiences across three years of training and war: I will trust you no matter what you have to say. Later, during a baseball game, he uses Perconte's nickname, Perco, because the situation was informal and relaxed. As another example, Winters commands Cpl. Joseph Liebgott to make sure a batch of POWs arrive alive and well back at camp. He uses the name "Joe" to reinforce the personal nature of his his request...and his authority. Liebgott's disobedience would not only violate a direct order, it would be a personal insult to their long history. Medics during WWII had the unenviable task of patching up fallen comrades during the heat of battle. Because they didn't carry weapons, they didn't exactly experience combat the same way their comrades did, instead occupying a strange middle ground between combatant and non-combatant. Medic Eugene Roe kept to himself, and his eventual attempts to break down personal walls met with mixed results. First he tried referring to Pvt. Edward Heffron by his surname. But no one else in the company did so. Then he tried Heffron's given name, once again finding that he'd misjudged: "Edward? Only the nuns call me that!" Eventually, as their friendship became more genuine, Doc Roe used Heffron's name of choice among friends: Babe. Insults and dirty or unwanted nicknames make up the final category in this brief survey--as far away from formal rank as possible. William "Wild Bill" Guarnere was also known by the less appealing nickname "Gonorrhea". But what had been intended as an insult morphed into a term of affection among the original Toccoa men with whom he'd trained. Only those among his inner circle could refer to him as Gonorrhea; others risked a punch to the mouth. However, respect could be earned by using the derogatory nickname in an appropriate, man-approved context. For example, Guarnere called an untested newcomer "Cowboy," much to the soldier's constant annoyance. This hazing only ended when the man learned to give as good as he got: "Shut your Guinea trap, Gonorrhea." To which Guarnere replied, "I like this kid." Variations in forms of address among men are different through the ages, but I believe they reflect one common behavioral trait: men respond instinctively to the hierarchical structure that frames their relationships with other men. I've presented very particular examples, but I'm curious to see what your research has turned up. Can you share examples of male forms of address from Roman, medieval Regency, or other eras?